Want to be a Sigma Affiliate like I am? | Sahrish Adeel - Malaysia based Pakistani Beauty & Lifestyle Blogger! Want to be a Sigma Affiliate like I am? Hey Everyone! I applied for the Sigma Affiliate Program some time ago & now I am working as one =) Its not just that you affiliate with them and promote their company, but you get to make money while sitting at your own home. You can make a 10% commission if someone makes a purchase by clicking on your link, and your also get a 1% commission if someone makes a purchase using your sub-affiliate's link. They make high quality hand made make up brushes. They make eye, lips and face brushes, they sell individual brushes as well as brush kits. They have launched their eye shadow palettes and skin care products as well. 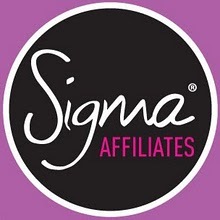 What is the Sigma Affiliate program? A program offered by Sigma where you can earn 10% commission on your direct sales. When you SIGN UP for their Affiliate Program, You get a link with a special code. If you have placed that link somewhere on your blog, Facebook page or YouTube Channel & someone clicks it and shop from their website, you get a 10% commission PLUS a 1% commission on all sales of your sub-affiliates. They also have started their Rewards Program, that you can see by clicking here. 1. Go to Sigma's website, and click on second option names as 'Join Program' under 'Become an Affiliate' tab in menu bar. Join the Sigma Affiliate Program. 2. Create a new account or sign in. What are the benefits of becoming a Sigma Affiliate? 10% commission on direct sales. 1% commission on sales of your sub-affiliates. How to do a Facial at Home! Garnier Skin Naturals Light! Coming Soon!